Gulf Cooperation Council (GCC) grows at 20% per annum and sets to become the No.1 source of the global petrochemicals and plastics products, according to Al Fajer Information and Services, the organizer of Arabplast 2013. 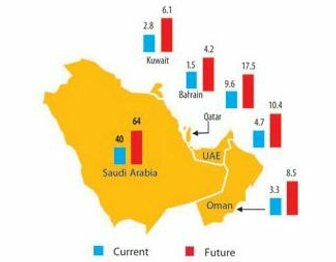 The petrochemical industry in the GCC region has become a major investment opportunity for the Gulf states. In 2007, ethylene was about 15 million tonnes including Iran. By the end of 2011 itself, it reached about 30 million. In accordance to the latest statistics quoted by the organizer, the polyethylene production capacities in the GCC are expected to increase from 10.7 million tonnes in 2009 to 21.5 million tonnes by the year 2015. The production of polypropylene is also expected to increase from 4.8 million tonnes in 2009 to 9.5 million tonnes by 2015, almost double the volume. That means, GCC production of polyethylene and polypropylene resins will rise to 31 million tonnes by 2015.